Roasting vegetables has become one of my absolute favorite ways to prep real food. Typically, on a Sunday afternoon, I’ll chop a bunch of seasonal veggies, ranging from potatoes to broccoli, drizzle the mixture with oil, and sprinkle the assortment with salt and pepper. Then, into the hot oven they go. Once the vegetables are roasted and cooled, I place them in a mason jar, and then place the jar in the fridge. Honestly, if it weren’t for my weekly vegetable roasting session, we probably wouldn’t touch some vegetables–in cooked form–during the busy weekdays. Sure, we could eat a bunch of raw veggies throughout the week, which definitely happens, but there’s something incredibly satisfying and versatile about having a stash of ready-to-enjoy, cooked veggies waiting in the fridge. On busy mornings, I may add the veggies to scrambled eggs, or pile them high on the side of “fried” eggs (reheated in the same skillet as the eggs). For lunch, the veggies may end up in a tortilla, along with shredded cheese, to make a quick quesadilla. If I’ve prepped quinoa in advance, I may serve the roasted veggies over a mound of quinoa with a hard-boiled egg or shredded chicken. The possibilities are endless! Along with a sheet-pan of random, seasonal veggies, I’ve also started baking sweet potatoes in advance. 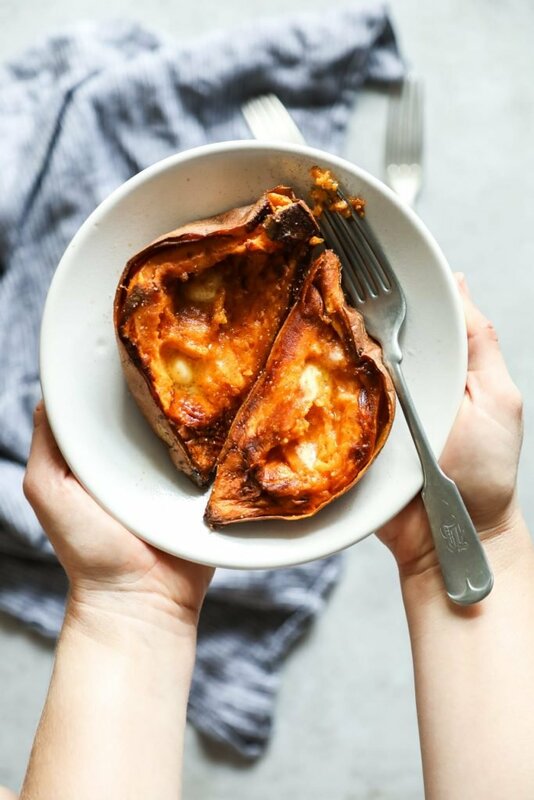 The baked sweet potatoes have become one of my favorite early morning breakfast meals to enjoy before a Pure Barre workout session. The sweet potatoes are easy to reheat in a skillet (or even the microwave). And they’re extra delicious when topped with a nut butter, bananas, cinnamon, and hemp seeds. And since prepping a sweet potato doesn’t create a lot of noise (unlike blending a green smoothie), I can enjoy a pre-breakfast, pre-workout snack in the wee hours without waking my family. Win-win! A large sweet potato can take a good hour, or longer, to bake in the oven. Honestly, that’s just a bit too long for me. And that hour-long bake time doesn’t always result in soft potatoes. Ugh! Last year, I decided that enough was enough. 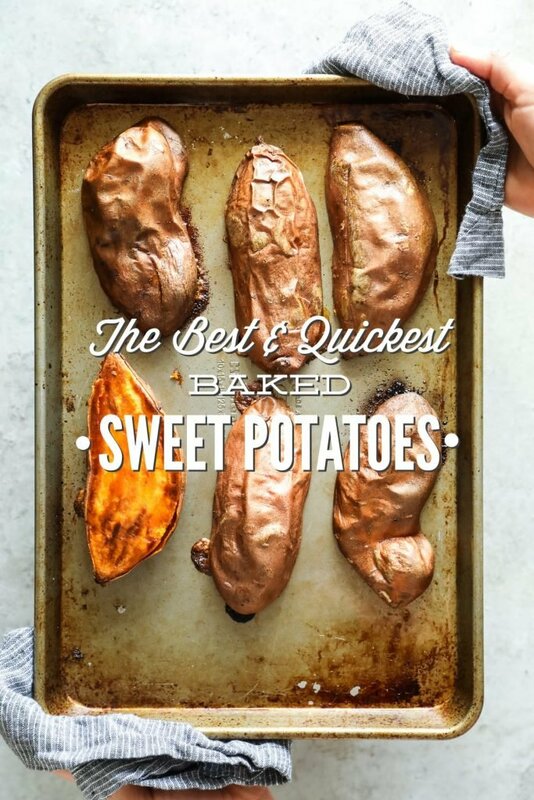 There must be a better way, a quicker way, a tastier way to make a baked sweet potato. Friend, I’m happy to report that I’ve discovered a secret to making the best and quickest sweet potatoes. 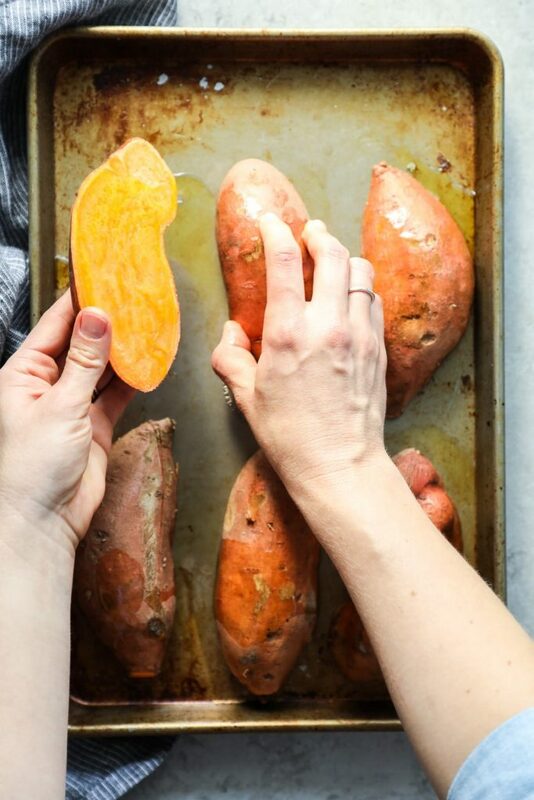 The secret to creating the best and quickest baked sweet potatoes is to first slice each potato in half. Sweet potatoes are an incredibly large and dense vegetable, in their raw state, which means they take forever to fully cook. When the sweet potatoes are halved, the baking time is dramatically reduced. But something else happens when the potatoes are halved. The halved potatoes, when they’re cooked flesh-down, caramelize. The end result is, in my opinion, the best baked sweet potatoes! In fact, I won’t ever go back to the traditional method of baking a sweet potato ever again. Perfectly soft, caramelized sweet potatoes in under 40 minutes. 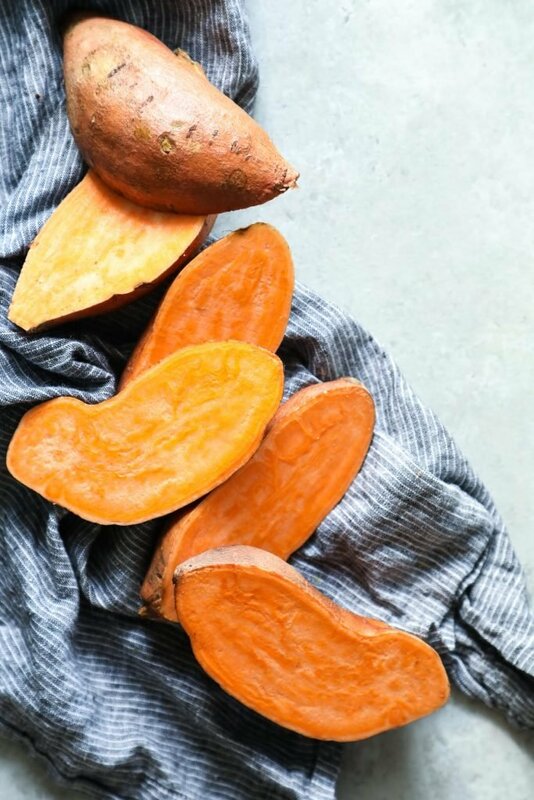 Prep these sweet potatoes in advance for a quick and easy real food option throughout the week. Cut the sweet potatoes in half, lengthwise. Place the potatoes on a rimmed baking sheet. Drizzle the potatoes with the oil, and then rub the oil on the flesh of each potato. Sprinkle each potato with just a pinch of salt. Flip the potatoes over, flesh-side down on the baking sheet. Some oil will spill over on the sheet pan--that's normal and okay. Bake the sweet potatoes, uncovered, for 30-35 minutes, until the skins begin to look shriveled and soft. Remove the potatoes from the oven. The baked sweet potatoes should be slightly brown and caramelized on the top of the flesh and soft throughout the potato. Enjoy the potatoes warm, or place them in an air-tight container in the fridge to enjoy later in the week. Wow..those look delicious!!! I love sweet potatoes, but like you said they take forever to bake! I will be trying this recipe out!! Yum!! I really appreciate your food/meal prep posts. I am definitely going to try this one out this week! Thank you for this! 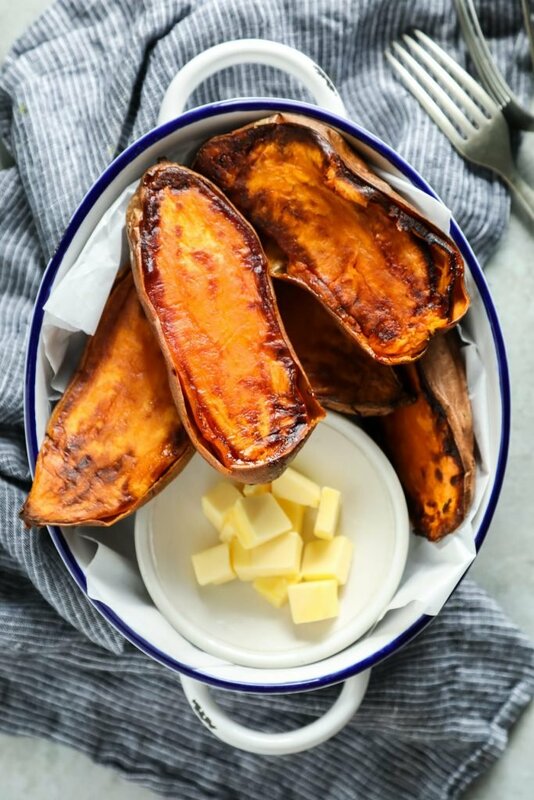 I have a few recipes that use roasted sweet potatoes, but I put them off due to the tiiiiiiiiiiiime…… These look amazing all on their own 🙂 Thanks for sharing! I know what you mean, Adrianne! I used to do the same thing. Enjoy!! I do the same thing with roasted veggies- add to eggs in the morning or serve a bunch of quinoa for a quick and healthy lunch. Thanks for the sweet potatoes post! Love them in their pure form. Love it, Terry! Roasted veggies are such an awesome way to add nutrients to a meal. Enjoy the sweet potatoes :). These turned out great, I appreciate these healthy and simple recipes. Awesome, Phil! I’m so glad you’re enjoying the recipes. 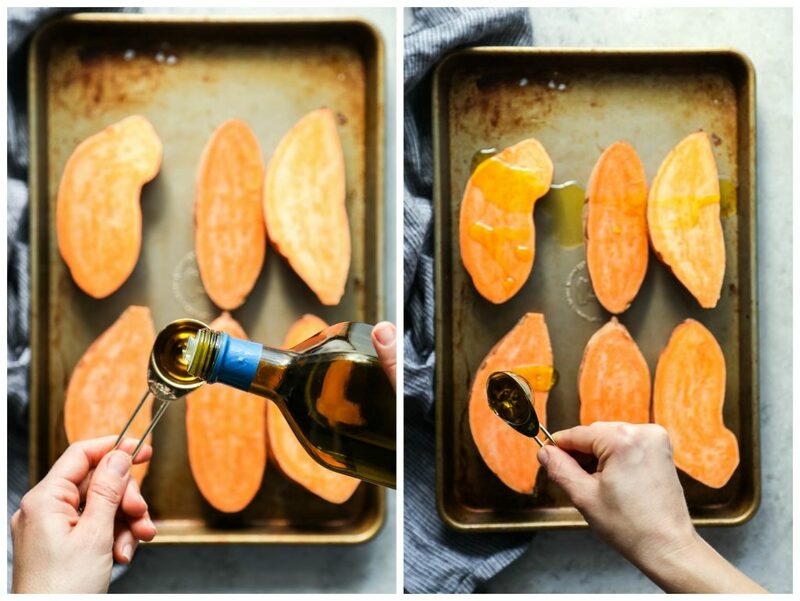 I don’t know which I like better – your sweet potato recipe or ideas for using roasted vegetables! Thank you for sharing both! These potatoes were so sweet and delicious! Yay, Marianne! I’m so glad you liked them. This is a wonderful idea!! I raise my own sweet potatoes and have a bunch so always looking for a quicker way to cook them. This recipe will be used weekly in my kitchen, for sure. Also, just FYI, you can also cook a big one in an instant pot and they turn out pretty good as well. God Bless you and your family. That’s awesome, Kim! I have yet to grow sweet potatoes–it’s on my list. And I need to try making sweet potatoes in the IP–what time do you use? These sweet potatoes are fantastic. I love that they only took about 40 minutes to bake and they taste creamier than when you bake them whole. Yay, Francesca! I’m so glad you’re enjoying the sweet potatoes. I’m so glad you like them, Karen! YUM!! My mother and my Aunt would wrap several in foil then bake. When they were finished baking they would then let them cool stick them in freezer in any vacant spot that they could. When they wanted one or more they just had to pull them out and use in any manner they wanted but usually with just butter on them. That was the way they liked them. You inspired me! I have 4 sweet potatoes (actually 2 sweet potatoes and 2 yams) in the oven right now! Thanks for this easier way to cook them!! (((LOVE LOVE LOVE))) these sweet potatoes, I made them and they were excellent. Hey Wanda, I’m so glad you love them! Glad to get these practical tips for make ahead vegetables. Hi Kristin, have to share a funny story: my husband and I are applauding this! I started doing this over 10 years ago when I got home late from work and my kids were starving and I was planning to bake sweet potatoes! I have not baked sweet potatoes since then, b/c everyone loves these so much. My friends and family are all doing the same thing! Cheers for publishing!! That’s awesome, Mary! Love it! P.S. One other thing I do to reduce work time is put the potatoes on tinfoil! Here’s another sweet potato method, if you chop them into rough 1-inch squares you can dump them on the same baking sheet as other roast vegetables (carrots, turnips, brussel sprouts, broccoli, etc. and roast them all together in a 400-degree oven. Roasting is simply the best way to cook veggies, period. Plus you don’t lose any of the nutrients like you do if you boil them in water. I’m so glad you like them, Rebecca! Loved these!! It took me a little closer to 45 minutes but I had really big sweet potatoes to work with. Cutting them in half made it sooo much easier, and easier for serving! I’m so glad you liked them, Ashley! I was looking up different ideas for sweet potatoes and came across your site. Hands down…This is best and most simple recipe! So sweet, creamy and delicious. All I topped them with was butter. I’ll be cooking them this way from now on. That’s awesome, Pete! I’m so glad you’re enjoying the sweet potatoes! Omg! You have changed my life with this recipe. Every time I’ve roasted them they came out dry and never soft. These are delicious, easy and fast. Perfect recipe. Thank you for sharing this secret. I just took them out the oven … they will be in our weekly meals now.. not just for the holidays… thanks for sharing..
Food snobs, stand aside……these are the bomb! I followed roasting directions and seasoned with just olive oil and pink salt. I had butter prepared for adding after plating, but it was completely unnecessary! These turned out to be so soft, moist and flavorful inside with a satisfying crust, that adding anything was just wrong. After one bite, I gobbled it down with ‘mmmm’s’ of pleasure. OK…….maybe a sprinkle of a spice to match it up with different main courses would be a good compliment, just to switch things around a bit, but this is a mainstay keeper. I can’t thank you enough for making my cooking so much easier! I’m so glad you love the sweet potatoes, Elise! Thank you for the sweet review. This method of cooking sweet potatoes has changed my life. OK, yes, my life’s a little boring, but regardless, I am completely hooked on cooking sweet potatoes this way and will never go back. Just made them last night! YUM! Wow! I can’t believe how simple and delicious these sweet potatoes were. I have a new go-to recipe. Thanks! I’m so glad you liked them, Lacey! Absolutely easy and delicious. This will be a weekly item! Awesome, James! I’m so glad you enjoyed them. I make sweet potatoes often. Fried, baked, and even microwave, etc. I’m baking them today as I’m tediously working toward a perfect sweet potato pie recipe. Here a tweak there a tweak. I wanted to bake them this time to the point of caramelization. Mine a re nearly done but my comments have to do with advice. I recommend weighing the sweet potatoes first as one will have much better luck if they are all similar in weight. Many will think size but there is a difference. Nonetheless having them fairly close in size will ensure even cooking for all potatoes. Definitely, T. Thanks for sharing. I didn’t mean to submit my review but had hit the wrong key. Anyway the potatoes are delicious as I am eating the caramelized portions. 🙂 Also, they should be done to the point the skin peels off easily and sometimes wholly. Glad you’re enjoying them, Tom. I just made these sweet potatoes tonight using this recipe, it was soooo good. I HIGHLY recommend cooking them using this recipe! I’m so glad you loved them, Sher! Living on a farm near the Sweet Potato Capital of the World means serving them in some fashion several times a week. Five stars for time saved, easy prep/cleanup, and great taste. Option – top with butter, brown sugar and cinnamon and slide back in the oven for a few minutes. Thank you for sharing these Awesome potatoes .. I love simple meals since we have busy lives working full time and this fits perfectly. Love the taste, have already shared with my friends ! You have changed the way I feel about baking sweet potatoes! They took forever to bake and now they cook in half the time and taste more amazing than ever before. Bless you ?? My mind is BLOWN, I will never cook a sweet potato another way ever again. Caramelised to perfection!!! Yay, Alannah! I’m so glad you enjoyed them. Cooked up perfectly and absolutely delicious! Thanks!! You were right . The absolutely best sweet potato I’ve ever had. Thank you. This recipe is so simple and they taste amazing! 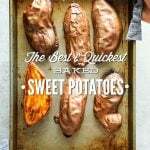 It is my go-to recipe for baked sweet potatoes! Thank you! Yay, Jodi! I’m so happy to hear that! so I meant to use this as a meal prep…but I kinda ate the sweat potato right out of the oven! So lovely! I have used this simple recipe numerous times. Pair these potatoes with some steamed veggies and fish and my meal is complete ? Yay, Sarah! Thank you so much for coming back to share and rate the recipe. Made these tonight for dinner with salmon and steamed broccoli…. these were so much easier and absolutely delicious! Like candy! Thank you so much!! Hey Milla, I’m so happy to heart that! I’ve made this exact same meal many times. So colorful! Awesome, Vermontah. I’m glad you’re enjoying the sweet potatoes. About to try this thanks! Quick question – Do you pierce the outside with a fork once or twice before baking? Hey Ken, No, you don’t need to pierce the potatoes :). Hello Kristin! Tried this recipe last night and it was so delicious. Last year I decided to become a vegetarian and since then have been trying new things. Such as sweet potatoes. I had my doubts because my family would struggle baking these. So, I’m really happy I found this recipe because it was absolutely worth trying out. I’ll be saving this and using it for further reference ? Awesome, Steph! I’m so glad you enjoyed the sweet potatoes. Your baked sweet potatoes are looking amazing. It’s a first for me to bake them and I am super excited. I also like that you cut them in half, this way I can try it with two different toppings ? You have a great blog! Also, thanks for the informative affiliate information! Hey Katie, Thank you! Enjoy! Thank you SO much for that wonderful hint! They are the best sweet potatoes I’ve ever had! Low in calories yet taste like they’re loaded with all that fattening stuff. Will never make a sweet potato any other way! Yay, Barbara! I’m so glad you’re loving the sweet potatoes. Just wondering if I could cook the sweet potatoes in a toaster oven, or do you need to do them in the oven? Hey Barbara, I’m not sure. Maybe? This recipe is a lifesaver. I was about to give up on baking sweet potatoes before I found this because I could never get them cooked thoroughly or they took forever. Thank you!! ? Wanted to say this recipe has saved me time and again. Don’t have to have more than an hour to bake sweet potatoes any more and my family loves them baked this way, too. Thanks for sharing this tip with all of us! Yay, Celeste! I’m so happy to hear that. So glad the recipe is helpful for you. Easy, quick, and delicious! Thanks for sharing a great recipe. I’m so glad you’re enjoying the sweet potatoes, Marvice! This has to be good, cant wait to have them with a slice of butter and spring onion on top, would cut a little pouch to let the butter melted thru the flesh ; ). Will report you back with feedback once im done cooking them this evening! Absolutely love this recipe! It’s become a staple in my house. When you heat them up, what method do you recommend? I’m looking to include them in my meal prep rotation, but unsure of how to warm them up so they are as delicious as the first time. Thanks! This recipe is amazing flavor-wise and saves so much time! This is the only method I use now! Baking some right now! Thanks so much! I made these and they came out unbelievably delicious! Can you follow the same method for a russet potato? If so, is there anything else you would season The Flash with aside from oil and salt? Hey Alexis, Yes, you can! Same method and oil and salt. I love sweet potatoes, but they generally tend to be covered in very tough dirt where I buy them from, so i usually scrub and peel them. Should I keep the skin on or will they come out fine if I peel them? These really are the best! Thank you so much for the recipe. Yay, Kate! I’m so glad you like them. Just pulled these out of the oven! I just tried your recipe. Followed the instructions exactly. However, the potatoes took ove an hour to bake. Hey Dennis, Were the potatoes extra large? Well, that is just brilliant! I cook sweet potatoes often and will try this next time to speed up… and get that yummy caramelization. Thanks!! Is it just me, or is it very difficult to cut the sweet potatoes in half lengthwise? I washed them first, and they were slipping all over the cutting board. Thanks for the extra advice. Hey Sarah, You could try cutting a piece of each potato in order to create a flat side to rest on the cutting board. So glad you enjoyed them, Brittney! Thank you very much for this. I too reached my wit’s end on how to accelerate the healthy sweet potato cooking process. I was wondering if you thought blanching them first, might make it even speedier; then halfing, and baking. Thank you for this. I’m so glad you’re enjoying the sweet potatoes, Erica. You are a genius! I’ve conservatively been eating sweet potatoes once a week for 6 years, and this IS the easiest, most AWESOME way I’ve every made them! They were fabulous! Soft all the way through, almost creamy in texture, and so sweet! Thank you so much for this recipe! Yay, Laurie. I’m so glad you’re enjoying the sweet potatoes! Just made this tonight! My husband and I loved it! Thanks so much! I nuke my potatotoes and sweet potatoes in the microwave first. In a pyrex dish, lid closed, just enough water to cook by STEAMING , not submerged. Poke with a fork after 10mins to test softness. Continue with oven bake as per recipe. Thanks for sharing your method, Leon. I make these almost every week. Easy, delicious and good for ya’? Talk about your no brainers. Thanks for this simple-y great recipe. Awesome, Brendan. I’m so glad you’re loving the sweet potatoes! After this recipe I don’t do sweet potatos any other way! The best! These were amazing!! This is now my go to recipe for sweet potatoes!! I made them for a potluck supper and everyone raved about them. Delicious! Thank you for posting. So glad you’re loving the sweet potatoes, Mary!